Amerks' Tuesday Practice; Meyer Returns · Let's Go Amerks! There is a new face on the ice today. That face stands about a full head above all the other players. Looks like the Amerks are making good with their promise to get us a guy who can plow through goons like Mirasty (Syracuse Crunch) with one fluid punch. This beast’s name is Riley Emmerson. He stands at 6’8″ and weighs in at 248 lbs. He was the tallest player drafted in the 2005 entry draft. 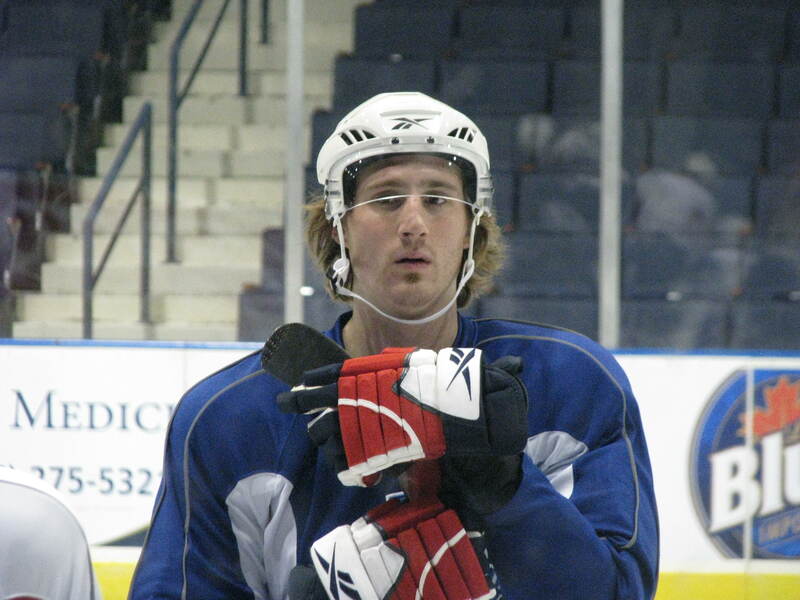 He was assigned to the Florida Everblades this seaon by the Minnesota Wild. Like posted yesterday, Curt Styres didn’t just want a guy who can just drop the gloves. Any team that looked on the Amerks’ bench during a game would have to notice Emmerson and bemore careful about the moves they make on the ice, knowing there is someone there who is going to protect his teammates. Check a few of Riley’s fights out in some YouTube videos. The very first thing I got to see when I sat down in my seat to watch practice today was Stefan Meyer getting on the ice. It’s pretty exciting to see him out there…like a missing puzzle piece returning to complete a picture. He is out doing a full practice. Hopefully this means he will be able to play this weekend. He is an important part of this team and I expect him to be wearing the other “A” when the time comes. Tyler Plante and Chris Beckford-Tseu were out early getting some extra tips from Bob Janosz. They have been working hard all season, but that just hasn’t been enough so far. Something needs to click and it needs to happen soon. Jason Garrison still has the greatest looking slapshot I have seen. He hits the net about 9/10’s of the time and it is powerful. Janis Sprukts was just at the white board after the coaches explained what they are going to be doing next. He was helping explain to his linemates (Matthias and Repik) where they need to be during the play they are doing. Keaton Ellerby was slacking during the sprints at the end of practice. He wasn’t going all the way to the lines and was almost beheaded by Benoit for it. He is now going to be the last person on the ice doing laps until he learns not to slack ever again. There was a lot of yelling and a lot of bad words for Ellerby when he was caught not doing the drill right. Ellerby looks like he wants to kill himself now. Rory Fitzpatrick even came out from the showers (in his towel) just to yell at Keaton for the slacking he did. Why Rory was taking a shower is a mystery to me. Missing players again today were Jordan Henry and Karl Stewart. Karl Stewart is out not because of injury, but because is having problems with his Visa. Plante told us everything will be worked out in time for Friday’s game. Tyler’s right, this team needs to turn this bus around and hopefully with the (possible) return of Meyer and the acquisition of Emmerson, this weekend can be the point in the season where we look back and laugh at our 0-5 start. Friday’s home game against the Quad City Flames starts at 7:35pm. That is only the first game of yet another busy weekend for the Amerks. On Saturday, the Amerks take the short drive down the 90 to face the Syracuse Crunch. I would tell as many fans as possible to get to this game. With Emmerson on the roster, there is sure to be a matchup with Jon Mirasty. If nothing else…that will be very good to see. And then on Sunday, the Amerks go down to Hershey to face the Bears. This will be a game I will purchase on the AHL Live network. I love to watch the two of the oldest teams in the AHL faceoff against each other.